VintageView WS61 - 18 Bottle Wine Rack in Satin Black. The brand new 6-foot Wall Series option is perfect for just about any place limited by height, including wet bars, kitchen countertops and pantries. As with our entire Wall Series offerings, these new racks are stackable and may be cut, allowing multiple configurations for any wine room project. Show off 18 bottles (750ml). Easy-to-clean steel resists visible wear. Width 7 1/2" Height 72" Depth 5 1/4. (2) Bottle neck support pieces. (2) Bottle rear support pieces. The innovative design of VintageView® wine racks allow you to display the labels on your wine bottles while maintaining a proper storage position. VintageView® wine racks also provide excellent airflow for long-term storage and display of your favorite wines. Available in four durable finishes to work with virtually any decor and backed by a lifetime guarantee, VintageView® wine racks are the perfect fit for your wine collection! Holds 18, 36, or 54 bottles of wine (depending on model). Mounts to almost any wall surface with ease. Great addition to any wine cellar. Vintage View® Standard & Custom Finish Options. Select from one of four smart looking finishes that come standard in the VintageView® product line. Choose from Satin Black, Brushed Nickel, Black Chrome or High-Polish Chrome. Additionally, you can match virtually any color in your decor with VintageView's flexible custom finish options. Dealer Limitations: Customers are responsible for understanding the proper way to install this product. Racks that were ordered more than 90 days ago, have been used (installed), arrive damaged, or are not in good saleable condition, are not eligible for credit. Wine Master Cellars ("WMC") warrants to the original consumer-purchaser that this product shall be free from defects in workmanship and materials under normal and reasonable use for the lifetime of the product. Some states do not allow the exclusion or limitation of incidental or consequential damages. In such a case, the above limitations or exclusions may not be applicable. 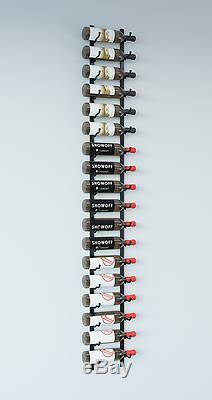 The item "VintageView WS61 6-Foot 18 Bottle Wall Mounted Wine Rack in Satin Black" is in sale since Tuesday, November 14, 2017. This item is in the category "Home & Garden\Kitchen, Dining & Bar\Bar Tools & Accessories\Wine Racks & Bottle Holders". The seller is "simplywineracks" and is located in North Salt Lake, Utah. This item can be shipped to United States, Canada, United Kingdom, Denmark, Romania, Slovakia, Bulgaria, Czech republic, Finland, Hungary, Latvia, Lithuania, Malta, Estonia, Australia, Greece, Portugal, Cyprus, Slovenia, Japan, China, Sweden, South Korea, Indonesia, Taiwan, South africa, Thailand, Belgium, France, Hong Kong, Ireland, Netherlands, Poland, Spain, Italy, Germany, Austria, Israel, Mexico, New Zealand, Philippines, Singapore, Switzerland, Norway, Saudi arabia, Ukraine, United arab emirates, Qatar, Kuwait, Bahrain, Croatia, Malaysia, Brazil, Chile, Colombia, Costa rica, Dominican republic, Panama, Trinidad and tobago, Guatemala, El salvador, Honduras, Jamaica.